One of my favorite shows is Star Trek and one of the most memorable characters was from the Voyager series, Seven of Nine. She was a former Borg, a species that strived for perfection and efficiency. Despite being separated from the Borg, she remained rooted in their values of striving for perfection and efficiency. Humanity often is very reactive at times in its striving for efficiency. This is especially true when it comes to natural disasters. Often times when we think we are prepared for the absolute worse, Mother Nature says, “Hold my drink.” and proceeds to exceed even our expectations of just what is possible from her. Worst case scenarios by municipalities have been time and time again blown out of the water (no pun intended) over the past few decades as climate change appears to be bringing about more volatile natural disasters. Over the past decade, Houston has seen a population boom since the Great Recession. While the rest of the country struggled Houston thrived and expanded almost 22 percent over the period thanks to triple digit oil prices. A construction boom inside Houston’s inner loop, historically a place most Houstonians avoided, took root. To the point, developers could not build fast enough for the population influx coming in from around the country. In the process though some serious infrastructure problems have started to arise. Houston was already notorious for flooding, now as developers took lots where once a single-family residence stood and put three to four townhouses on them, green space drastically reduced and the notorious flooding has become even worse with water having virtually nowhere to go. Enter, Harvey. To be fair, Harvey is an unusual beast of spectacular fashion, although Irma may prove to be the start of a trend. Somewhere between 10-15 trillion gallons are what is expected to have dropped into the city of Houston after Hurricane and Tropical Storm Harvey was done. It is an unprecedented event for the fourth-largest city in the United States. To put it in perspective, imagine the entire state of Delaware which is comparable to Greater Houston’s almost 2300 square miles of geography, with six times the population being submerged under water. Greater Houston’s population is well over six million and the last time a mass evacuation was tried twelve years ago, more people died in the evacuation than in the actual storm. 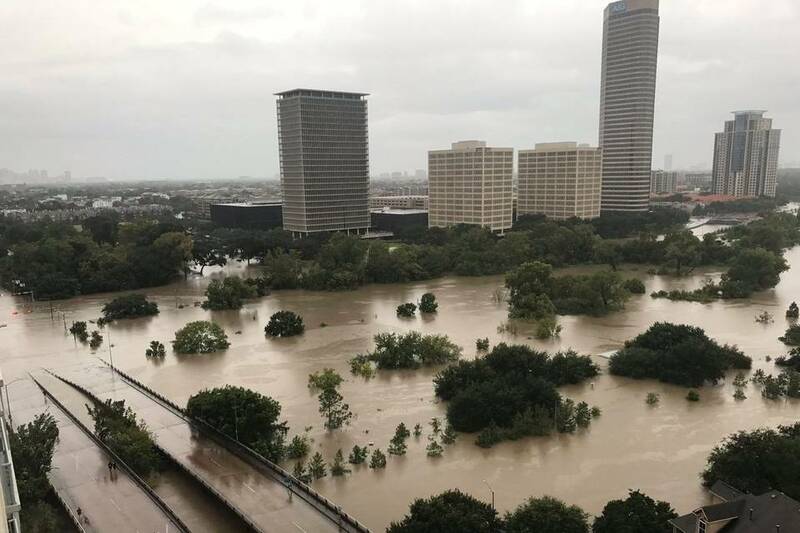 It would likely require Houston a week or two to have a calm organized evacuation that did not overwhelm the city and state’s highways and roads. And perhaps at this point, trying to evacuate people is just the wrong idea. There are so many logistical and socioeconomic problems with trying to do so, all one needs is to look back on Hurricane Katrina for a reality check of why it is nearly impossible to do so. So how can a city like Houston and others learns from the lessons of Harvey? Often times, what we need is right in front of our face. In the case of Harvey, the case is no different. Having to drive throughout the city during the storm where virtually every business was closed something striking occurred to me. Office buildings that were over ten stories were ghost ships, while most shelters are assigned to schools and churches that are usually no more than two stories. The office building ghost ships, that is to say that there was absolutely no one in them are an untapped asset in the city’s emergency infrastructure. As of 2015, Houston had 50 office buildings under construction totaling almost 18 million square feet of space. The locations of these buildings are widespread like Houston covering areas like downtown, the Energy Corridor/West Houston, the Woodlands (north), and others around the city creating a virtual net of buildings that if properly prepared with their owners could have been used at emergency shelters far above the flooding waters and much shorter distances to travel for Houstonians than what was comprised. The city’s major convention center, George R. Brown Center, was turned into the central hub of evacuation. Unfortunately, Houston’s geography is expansive. The city at its widest points can easily take almost two hours to get to the city center by car when traffic is not impaired. Couple that with low storied churches and schools and it is easy to see why office buildings which are more plentiful throughout the city could be a vital addition to emergency planning. What obstacles could be holding them back? I suspect three main issues. One, the city’s planning department would need to ensure future buildings include potential emergency use in the developer’s plans. It would also require these buildings, their owners, and their tenants to be part of any emergency planning committee that would go into action should it be required. Almost the equivalent of a volunteer emergency force. Second, the additional cost that could be associated with fitting current and future buildings for such a task must be shouldered somehow. These costs that could certainly be offset by favorable tax credits for a period of time, municipal subsidizing, etc. The third issue would be security of sensitive information. I can not stress how vital this would be in considering which office buildings to consider given the sensitivity of identity theft both on a individual and institutional level. Again, all three of these things are logistical things that can be handled accordingly. Every time we think we have seen the worst that Mother Nature has to throw at us, the ante seems to be upped just a little (or lot) more. We are continuing to change the dynamics by which we interact with our environment and in turn how the environment interacts with us. The burden of just how we handle future stresses that the natural disasters may pose will take a more broad minded and efficient strategy than what we currently use. Moving and evacuating large bodies of people will only get less and less likely in cities where density is increasing. One of the key to taking on a lot of weight is to spread out the weight so that it is properly balanced. The same goes for cities when it comes to disasters. It was one evening some years ago that my father and I had a debate in my parents living room about an article that I read in the New York Times concerning prep schools versus public schools and how much they spend per student. The New York Times stated that Philips Exeter Academy in 2008 spent $63,500 per student annually, while a report from the Organization for Economic Cooperation and Development shows that the U.S. as a whole spends about $12,000 per student annually. My father could not understand what PEA could possibly be spending over five times the amount on. I said to him it was the difference between showing a kid a map of India and taking them there. That being said, as someone who comes from a family of educators and being a community college professor for a period of time and seeing just what happens when an adult has had a weak K-12 experience, I often ponder ways in which communities can go about closing education gaps among groups and strengthening the education infrastructure. Perhaps the worst kept secret is that groups who come from disadvantaged backgrounds have a chronic gap when it comes to education. By age three, children from lower income homes have heard 30 million fewer words. The national high school graduation rate for African Americans is 73 percent, which is almost 10 percentage points lower than the national average and 14 percentage points lower than European Americans. There have been calls for a universal Pre-K, which sounds good in theory but probably will ultimately do just as much harm as the current system. Many have argued that the U.S. does not spend enough on education, this despite the OECD saying that the U.S. actually spends more than any other country on education. The report according to CBS News that, “In 2010, the United States spent 7.3 percent of its gross domestic product on education, compared with the 6.3 percent average of other OECD countries.” This appears to be not a case of not spending too much, but spending it poorly. As an economist and investor myself, one of the most important things for my firm is capital allocation. It is not just a matter of how much we are spending, but where and how we are allocating that spending. Simply spending more is not always an answer to fixing problems as many on the political left suggest, but neither is allowing students to go to better schools through vouchers a sensible alternative as those on the political right suggest which would have devastating effects on the economics of poor and middle class communities. In essence, what is needed is a better creation of supplemental education for those communities. Supplemental education is the ability to access learning away from the four walls of a school. For many upper income families, museums, summer camps, and private tutors provide the moonshot to the education they receive during their K-12 matriculation. These experiences and building blocks add to a substantive educational gap between the haves and have nots and while there are always many fascinating high brow proposals of how to fix education for underserved communities, we often ignore the simplest. Two things of note should be focused on to that respect. First, provide supplemental education where the people you hope to reach spend their time. Secondly, keep it simple. Academics, again I come from a family of them, while I admire their ability to convey information, they are at times too smart for their own good. In other words, they can make one plus one into the next coming of Einstein’s theory of relativity if you give them enough time. For underserved communities though it is often at the foundational level where they are most deficient. An issue that then cascades and compounds year after year as they progressed through secondary and then into adulthood. It was the simple foundation that they missed and that their kids are missing that could have moved their trajectory. So how do cities both meet the people where they are and more importantly where their time is “hostage” and and also keep it simple? Bus stops. That is right, bus stops. New York City has 16,350 of them, Los Angeles has 15,967 bus stops, Chicago has 10,813 bus stops, and Houston has approximately 9,000 according to a Twitter inquiry. 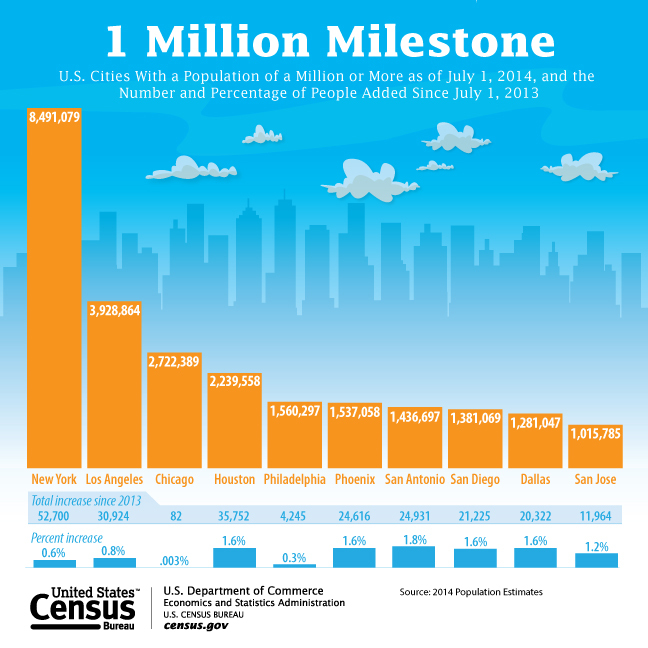 These are the four largest urban cities in the United States of America with a combined population of 17.5 million, a number equivalent to 5.4 percent of the entire U.S. population. The four cities ability to serve low income and middle class families is obviously magnified just by the probability of the sheer size of the populations they have that will fall within those confines. The poverty levels for the four aforementioned cities is also surprisingly inversely correlated to their public transpiration size with New York City’s 20.3 percent, L.A.’s 22 percent, Chicago’s 22.6 percent, and Houston’s 22.9 percent. According to Pew Research Center, “Americans who are lower-income, black or Hispanic, immigrants or under 50 are especially likely to use public transportation on a regular basis.” There is not enough research to show a correlation to public transportation’s reduction in poverty, but one can access that the easement of which labor can move farther distances allows for more economic opportunities to be gained. Therefore, if a low-income community has access to affordable public transportation and their own community lacks economic opportunity, the ease by which they can move into areas of stronger economic prowess may allow them work opportunities they may not otherwise have available. However, while there maybe no correlation, there is opportunity to educate and we know that correlates to reducing poverty. Imagine for a moment that each bus stop, both children and adults, are introduced to a digital screen (think those annoying “commercials” at gas station pumps) that circulates a plethora of vocabulary words, basic mathematics problems, and science and history clips. Just the basics, but again fundamental. If a city really wants to get out of the box, even introducing lessons in financial, health, and government literacy. If done in concert with the school districts in the city, teachers at the elementary through college levels could be featured in these videos and those teachers targeted in bus stops within their teaching area. This may also go a long way into reestablishing what many now complain about as the broken bond between parents, their children, and the teachers who educate them. The videos produce a familiarity for the teacher in the same way that people develop affinities for celebrities they have never met. Of course, in this age where municipals are tight on funds, just how does all of this get paid for? This is a financial journalism publication after all. The PPP (Private-Public Partnership) model would be most advantageous. Companies in the city, New York City, Houston, and Chicago have 143 Fortune 1000 companies combined, would foot the majority of the bill for the producing of the digital content and refitting of the bus stops. Just what those companies would receive in return beyond goodwill and basic advertising would be left up to the leadership of the city to negotiate. I grew up in a household and family where education and learning was not only a family value and expectation, it was something I was immersed in as I reflect in what seemed like at all times. There were always books around, much of my life existed on a college campus as my mother has been a professor for almost four decades, trips to museums, engagement with the arts, and as a result me and my sister’s probability of succeeding was given a great advantage over many of our peers. Education is a wholistic lifestyle that one is immersed throughout their lives. The sooner that immersion, the more often that immersion, then probability of success is sure to follow. My sister and I were at an advantage, we were a privileged pair whose family can trace our educational heritage back four generations to my great-grandfather and great-grandmother who were college graduates. That is not the reality for most low income and middle class families. They are families trying to take that next step, even if they do not know which step to take often. In order to increase their probability towards that success, cities have to acknowledge that they are often in poor schools to begin with and that they need more, much more. The best return on investment is often achieved in using the infrastructure that already exist and that meets citizens where they are. As Jef Raskin alludes to in his quote, communities will not care where quality education happens be it in a school or at a bus stop, so long as it happens. 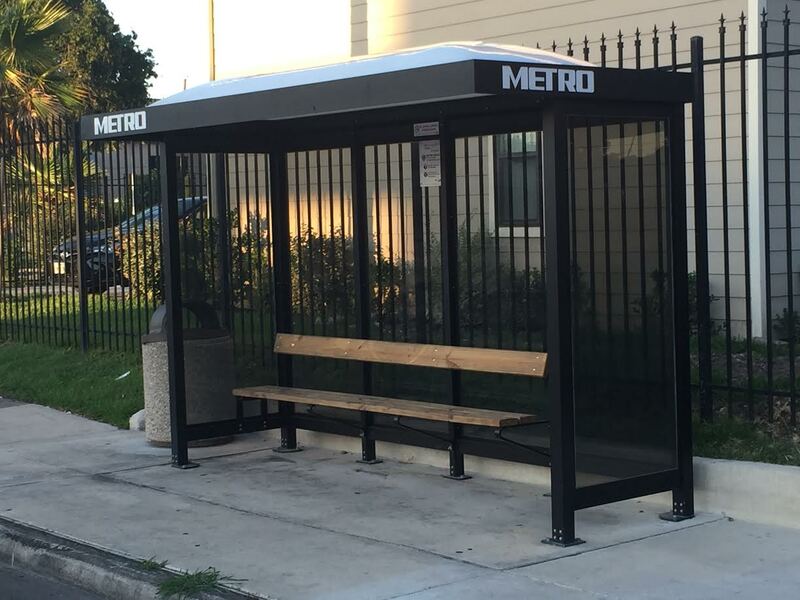 The ability to convert bus stops into head start and continuing education facilities for a city is something that truly does what needs to be done. There is something to be said for African Americans. We are some of the most forgiving and oft as Dr. John Henrik Clarke said naive – socially and politically – of the rationale behind the behavior of other groups in their interaction with us. Our desire for acceptance (see assimilation) into the mainstream of America society sometimes makes us accept behavior from others that pushses against our own economic, political, and in this case social interest. After picking up a friend last night, I headed towards home and we passed one of Houston’s most respected and renowned eateries, The Breakfast Klub. Located in Midtown, an area of Houston which was gentrified and was formerly a combination of the city’s Third and Fourth Wards. That in and of itself could require an entire article to be written but I digress. I glanced over and noticed the mural of President Obama, commissioned by the restaurant’s owners Marcus and Melvinie Davis, to show their immense respect and support for the president had been annihilated with swaths of paint. Mr. and Mrs. Davis are an HBCU family and Mr. Davis proudly and oftly shows his support for his alma mater Texas Southern University for which he also serves as the alumni association’s president. The mural as I recall was originally put up about four years ago during the now president’s time as a candidate. Even then I recall it being vandalized on numerous occasions with one particular incident involving what appeared to be red paint balls shot toward President Obama’s head in the mural. These acts are brazen to say the least as the owners’ went so far to implement security cameras around it. To say that President Obama has been polarizing and an uncomfortable presidency for America would be an understatement. The image of a powerful African American family has even been polarizing for many and responses to such have ranged from outright threatening to veil undertones of menace. 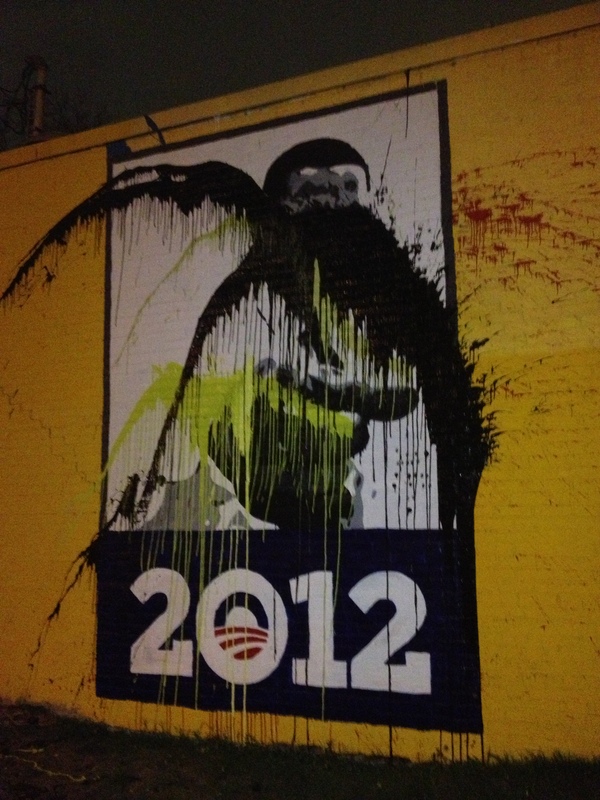 Vandalizing a mural is more than just saying you do not like the president. You can do that on blogs, television shows, twitter, and even in an article. I have even been firmly against some of the president’s policies as they relate to African American development and overall economics. However, I show the office of the president respect whomever is in it, which we know is not a simple or easy job and I show an African American man who is a husband, father, and striving for an ambition beyond himself respect. Something some of our combatants do not seem to want to do. Many in the African American community were not fans of the Bush family. However, you never saw effigies burned in our community towards any of the men holding the office of president no matter how much we disliked them. Maybe it is our fault that these things continue to happen because there is no consequence to the harming of anything we possess and hold dear when stamped and trampled on by others – not even our very lives. We are always ready to forgive. We are always ready to march. We are never ready to act in self-defense or even take an offensive to show we are not doormats. If anything were to happen to an images or statues of Washington, Reagan, even dare I say Clinton – there would be a call to arms about the sanctity of respecting the institution of the presidency of the United States. Yet, we concede to disrespectful behavior after a few cries and whimpers about not being treated fairly. This morning after taking another drive past the mural it appears that the owners’ have either decided they have had enough or that they will repaint it better and bolder. It is yet to be determined as they have painted over the entire mural in white paint and in doing so erasing the vandalism and the President’s picture. There is much irony in that prior sentence when one examines it. In the end, I believe they should have left it up for awhile. To send a reminder to African America that if you believe we have arrived because there is an African American president you truly do not understand the war you are beholden in. We have turned both cheeks and even dropped our trousers and had those slapped. Our institutions come under fire and asked if they are relevant. Our citizens from babies sleep in Detroit to men the night before their wedding day in New York day shot down by police and “police” citizens. Our social fabric attacked at every waking and sleeping moment by others. Will we ever respond or continue to cower our social interest again and again and again for the sake of “peace” and “unity” while our humanity is disrespected and trampled upon?